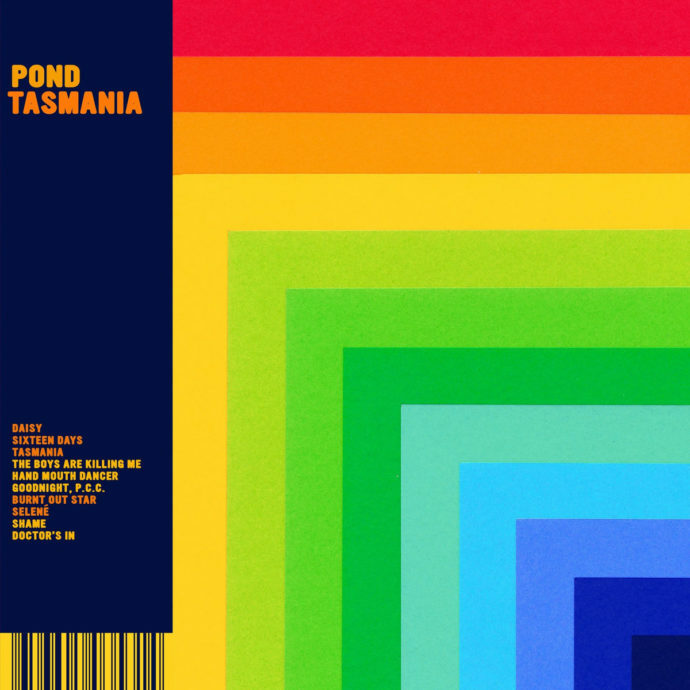 Leaning more into their avant-pop side, the recent Pond release, Tasmania is filled with (odd) dance tracks. Where The Weather gave us rock riffs and kit drums, Tasmania utilizes synth arpeggios and drum machines to achieve a dizzying amount of layers. Pond stretches the flexibility of their genre-bending antics with flourishes of hip hop and 90’s style R&b. “Sixteen Days,” like many of the other tracks, is mainly electronic, featuring a wiggly synth bass and a choral melody reminiscent of Daft Punk. In stark contrast, the title track, “Tasmania” follows; the recording is clean, modernized 70’s style with Nick Allbrook singing in a high-pitched whine, like Justin Timberlake in an SNL sketch. I found that, although there were many lyrics that felt toned-down and responsive – perhaps even towards the reviews of their previous releases – the more I heard the songs, the more connected I became to the lyrical content. “The Boys Are Killing Me,” for example, is not making that bold of a statement for the most part, just a statement about understanding the ways that toxic masculinity affects men as well. A heavy line like “I don’t know if I can trust my country anymore,” adds another layer of meaning though, and are indeed bold for such a popularly accessible son structure. Even songs like “Hand Mouth Dancer” connect with pop music as it ventures into stadium rock style. The synths are buzzy throughout, but as the song progresses into a breakdown, they become more distorted and bit-crushed. Songs like “Goodnight P.C.C.” and “Shame,” lean more into experimental or avant-pop, shaking off the melodic quality of the previous songs and are far darker. Overall Tasmania is a well-rounded album, structurally, most songs break the standard, V-Ch model, including both singles. Considering how often Allbrook calls out to his country, Australia within this album, listening from the United States, or another country, and relating to a lot of the major issues covered is probably not a unique experience. It offers its own sense of clarity and relief to hear others writing music in opposition to toxic masculinity, and willful ignorance toward climate change. The strings in “Burnt Out Star,” serve to create something organic among the sharper edges of the album. The lofty atmosphere is accentuated by harmonic vocal “ahs” and arpeggiations. “Selené,” features a funny woodblock-like drum machine and a funky bassline channelling something in between Outkast, and if stadium rock artists were more honest about their disco influence. With tremolo on his vocals, Nick Allbrook’s pop persona hides within echos and reverberating metallic noise. There’s a tangible struggle between the desire to spread a message through music, and knowing that “talk is cheap.” Within this record, as usual, Pond tries to communicate complicated feelings regarding the modern world. The difference between this, and other “protest albums” is its blaring self awareness. Acknowledging their own partial activism may help others do the same.